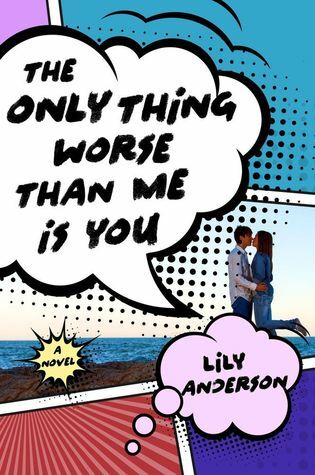 We're excited to have Lily Anderson here to give us the scoop about her debut novel THE ONLY THING WORSE THAN ME IS YOU. Lily, what was your inspiration for writing THE ONLY THING WORSE THAN ME IS YOU? I’m a school librarian. When I started writing THE ONLY THING WORSE THAN ME IS YOU, I was working in an elementary school that had 900 students from kindergarten to eighth grade. I was really blown away by the fact that they were so passionate about things that grown-ups consider to be part of nerd culture—Star Wars, Harry Potter, Doctor Who, Marvel movies, DC movies, Lord of the Rings. It was so intrinsic to who they all were and I couldn’t help but wonder what it would be like for them to get to high school, not knowing that fandoms were something we used to have to hide under a bushel. Obviously, there’s the crown jewel of books about fandom—FANGIRL by Rainbow Rowell. Rainbow is such a masterful writer and I think that she captures the online fandom community so well. I’d also recommend IN REAL LIFE by Jessica Love for more friendships and swoon and THE FANGIRL’S GUIDE TO THE GALAXY by Sam Maggs for more fandom and feminism. I also have an entire list of all of the comic books referenced in TOTWMIY on my website (mslilyanderson.com). How long did you work on THE ONLY THING WORSE THAN ME IS YOU? Since I was writing it for fun, I wrote the first fifty pages of the book in a month or two and then took half a year off to work on other projects and move and find a new job. I wrote the rest in about four months of obsessively working on it. After I got my agent, I did a rewrite and then another when I signed with St. Martin’s Press! Writing this book taught me to write a story that I would want to read. I had written a YA novel before, but held too close to what I thought YA was supposed to be, rather than what I would want to share with a teen audience. What do you hope readers will take away from THE ONLY THING WORSE THAN ME IS YOU? First of all, I hope that readers have a laugh or two. TOTWTMIY is a comedy, first and foremost. But I also wanted to spark a conversation or two about kindness. Trixie, the main character, does not start the book out as the nicest gal in the world. She always chooses a cheap joke over sincerity, often at the expense of other people’s feelings. Halfway through the book, she starts facing the consequences of her thoughtlessness and has to learn to be mindful and find the balance between snarky and mean. Oh my goodness, the books that will never see the light of day! I started writing consistently when I was a tween, so I have whole hard drives full of ancient fan fiction and angst ridden teen poetry, notebooks full of false starts and vague ideas, and a handful of New Adult novels that I wrote mostly to entertain friends. The first time I tried to get a literary agent, I was 19 and I had to send my queries in by mail. Then I was 23, shopping a novel that wasn’t quite New Adult or Women’s Fiction and never found a home. And, finally, I signed with my incredible agent, Laura Zats of Red Sofa Literary Agency, shortly after I turned 25. THE ONLY THING WORSE THAN ME IS YOU was shopped for about six months. St. Martin’s Press made the offer on the book on my 26th birthday, December 15, 2014. Writing has been a very solitary act for me for many years. I don’t write in a critique group and I haven’t had a writing partner since middle school. So, in having an agent AND an editor, I was really blown away by having a team for the first time. Normally, when I “hit the wall” on a plot point or the structure of the book, I puzzle it out by writing a lot of things that end up in the recycle bin. Getting notes from my agent (Laura Zats) and my editor (Sylvan Creekmore) really made me look at the book from so many new perspectives, which let the story go down routes I had never envisioned for it. I tell myself that I write every day (much like I tell myself I exercise every day), so that if I end up writing four to five times a week, I’m doing pretty well. Once a story has cracked open in my head, I will actually write every day for a couple of hours after work and in two to three hour blocks on weekends. I used to write exclusively outside—on my patio or at a coffee shop, but I’ve been training myself to work anywhere. I have a beautiful home office that I almost never use because I’ve been sitting next to the picture window in my living room or in a dark corner at Starbucks. I always write to music (or, if I’m particularly distracted, music and a white noise app). When I start a manuscript, I make an extremely long playlist of songs that evoke the feeling of the book. I never reuse the same songs for different books so that each playlist can be a sort of gateway back into the feeling of the story. It’s particularly helpful when doing rewrites and copy edits and I’ve been away from one manuscript for a while! After I got published, the thing I heard most often (after “congratulations!”) was, “I’ve always wanted to write a book” or “I have a book idea, but I just haven’t found the time.” First of all: don’t congratulate people by talking about how you could do their job. It’s rude. BUT secondly: write a book! It’s not going to be perfect the first try—nothing is. It might not even be good the first time. But it will never be good if you don’t keep trying. Write what you love, write what scares you, write and find the joy in the process. Right now, I’m working on another book about nerdy geniuses and a juvenile delinquent mystery series—both are YA comedies. Lily Anderson is a school librarian and Melvil Dewey fangirl with an ever-growing collection of musical theater tattoos and Harry Potter ephemera. She lives in Northern California, far from her mortal enemy: the snow. Have you had a chance to read THE ONLY THING WORSE THAN ME IS YOU yet? Do you have hard drives full of writing that will never see the light of day? Do you find joy in the process of writing? Share your thoughts about the interview in the comments! I love this cover. Can't wait to read. Need a funny read this time around after reading so much drama ones.